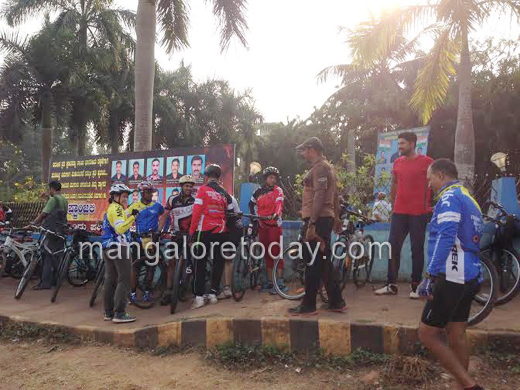 Mangaluru, March 07, 2016: A contingent of about 60 plus cyclists of Mangaluru came together on Mar 6, Sunday morning spinning on their cycles to express laurels in solidarity and gratitude to the Indian Armed Forces. 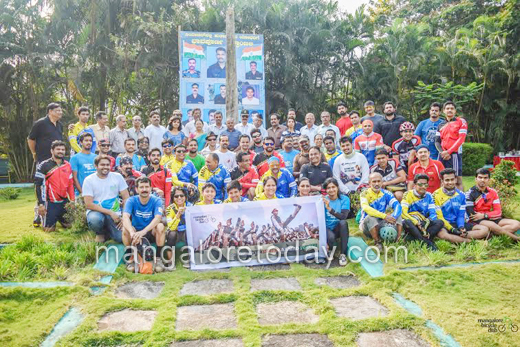 Members of Mangalore Bicycle Club and Mangalore Cycling Club joined hands to shower appreciation to the personnel of the defense forces discharging duties on the borders to protect the country and its citizens. Starting from Navabharath Circle, the cyclists went around Mangaluru, through K S Rao Road, Hampanakatte, Mahatma Gandhi Road, Lalbagh, Kottara, Lady Hill and Bejai and on to the War Memorial in Kadri. They were greeted by members of Dakshina Kannada Ex-Servicemen Association at the venue. It is reported that many cities around India followed this programme to show their love for the Armed Forces. Brig. (Retd.) I.N. Rai said that the service personnel were touched by the gesture shown by the cyclists and were glad. Brig. Rai said that it is unfortunate that some sections of society have openly been supporting anti-India initiative. “I do not belong to any political party. But this kind of terrorism hurts us the most,” he said. He added that the fight was against different kinds of terrorists. In his introductory address, Mangalore Bicycle Club founding -member Ganesh Nayak said that the “Ride for paying Tribute to Indian Armed Forces” was conceived during his 2,020-km solo ride from Mangaluru to Indore last month when he met a retired Brigadier. The personnel were upset that not many citizens cared about their sacrifices and thus he thought of organising the event to boost their morale. Association president Vikram Datta, Col. (Retd.) P.K. Shetty, Capt. (Retd.) Deepak Adyanthaya, Bhavani Shetty, Bhagavan Das, Bhadrappa, Col. (Retd.) Jayaram and Harishchandra Shetty were present. Riders Panambur Abdul Khader, T.K. Raheem and Sarvesh Samaga brought their sons aged 7-9 to pedal along with them for the cause. Also a visiting Aussie architect of Mangalore origin Reny D’Silva was an enthusiastic participant. In a statement the Club said, "Paying our tribute to the brave and courageous soldiers of Indian Army, who are the force behind ensuring stability and peace in the nation and our individual safety too. The challenges and hardships a soldier faces in the battlefield to ensure the citizens of the nation are safe and secure deserves acknowledgement beyond awards, salutes and anything like that. With all respect and love from our hearts, to each and every soldier for their outstanding loyalty, selfless service, courage and commitment towards our nation humble gratitude. They leave their family and all the comforts of a normal life behind to serve the nation with utmost devotion. They are always there, be it national security or a natural disaster to support. There is a better today just because of the sacrifices they make." The candidates contesting for election must be made mandatory to join one from the family to serve the country.Just come forward to loot the people. Then they will take one step back as being a soldier is not an easy task. The soldiers are the real Heros .Our respect have to be towards as they fight and sacrifice for the sake of the nation. Wonderful campaign by the cycling club.